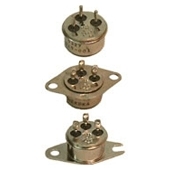 The Klixon 5BT series thermostat is a high reliability, hermetically sealed thermal switch. The single pole, double throw design allows versatility and economy in providing two functions within the same device. Typically these Klixon switches are used to control and indicate at a preset temperature. One pole can control a cooling fan and the other pole can indicate impending danger.